Judge for yourself. We think it couldn’t have been done much better, except possibly for a few Machiavellian struts on fighting terrorism. But hey, if he needs that! Here are the highlights from President Obama’s 2015 State of the Union speech, including zingers on climate change and calls for tax reform. In the wake of the GOP rout in the midterms, the president responded by announcing a series of aggressive executive actions, including measures toprotect millions of illegal immigrants from deportation, to work toward reestablishing diplomatic relations with Cuba and to strike a climate agreement with China. This entry was posted in Politics and tagged Obama, PRESIDENT, STATE OF THE UNION by fshiels. Bookmark the permalink. The morning before the State of the Union I received a call from Mercy College asking if I’d represent Mercy as a commentator on the State of the Union for Westchester News 12. I asked them to ask Prof. Shiels (our blog host) first, but when I called back in an hour, he was still not available. So I volunteered. I’m attaching the You Tube clip of my comments. I really only had a few minutes to say anything. And I was trying to be more of an impartial observer (as properly representing Mercy College political science), and less a political party promoter (as I could be in my other role as Vice Chair of the Teaneck NJ Democratic Municipal Committee). The thing was that the other commentator came on as purely a political party operative–and he was given the last word by the TV anchor. He described Obama’s speech as having “no there there,” which is inaccurate and a cheap shot. What I was raising was a real important question from the point of view of all sides of the political spectrum–is there an important component of the congressional Republicans who are ready to sit down with Obama and his representatives, to move the country forward–in spite of their differences. The morning of the State of the Union I received a call from Mercy College looking for a commentator to represent Mercy on Westchester News 12. I recommended our blog host (Prof. Shiels), but when I called back in an hour he was still unavailable. So, ham that I am, I volunteered. I only had a few minutes to say anything. And I was paired with a very partisan Republican—who the host let have the last word. 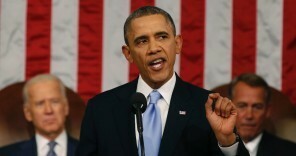 And his last word was to characterize Obama’s speech as having “no there there,” which was really an unfair cheap shot. And I was trying to be a proper representative of Mercy College political science, instead of playing my other role—Vice Chair of the Teaneck NJ Municipal Democratic Committee. Still, I think I raised the important point: Are there now enough Republicans in the House and the Senate who are ready to work with Obama to move the country forward—in spite of their differences with him. What I was thinking is that a number of the Republicans elected to this Congress expressed more moderate views than in previous campaigns, so maybe some of them are ready to move beyond implacable Tea Party rejectionism.